FC Bayern München's winter training camp in Doha is precisely that, with particular emphasis on the word 'training'. Any thoughts that the record champions are in relax mode have been duly dispelled with Carlo Ancelotti's men sweating under the palm trees in order to be fit for when it matters, although they had to deal with a setback on day five in Doha with Thiago Alcantara picking up an injury. Click here to make the most of your unlimited Official Fantasy Bundesliga transfers and maybe react to Thiago's injury! "We're working very hard and intensely," said goalkeeper Manuel Neuer on Saturday. "I think we need it too." The aim is to be ready not only for when Bayern get the ball rolling again in the Bundesliga at home to SC Freiburg on 20 January, but to be even sharper than before following the first prolonged period of training at Ancelotti's orders since the summer. "It's great to be able to be all together in a training camp – it's the first time for some of us with the new coach," added the Germany number one, once again voted as the world's best goalkeeper in 2016 and visibly keen to earn that accolade for a fifth straight year in 2017. "It's important for us to understand the new style of play better because we lacked that a bit in the summer." Thiago for one had to miss the first round of the DFB Cup due to an injury in the summer, and his hopes of completing a full training camp this winter were dashed on Saturday when he was forced to end training after half an hour. 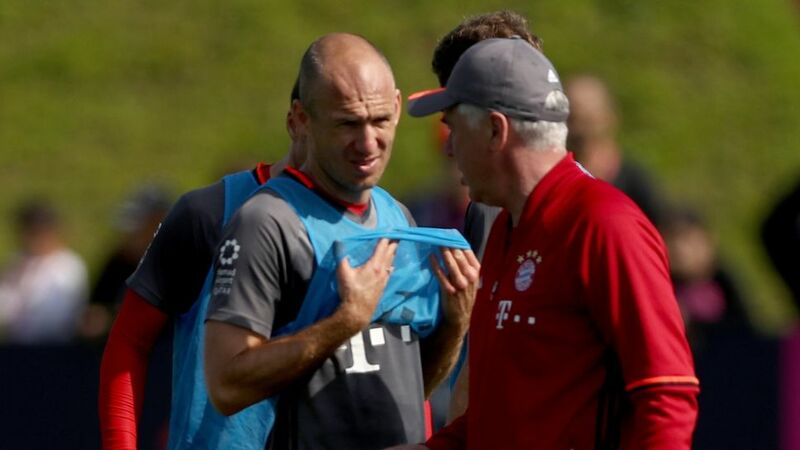 Arjen Robben is another who missed out on laying some key groundwork ahead of the season with an adductor injury forcing him out of the whole of pre-season. He took plenty of mental notes while working on his comeback, though, and is now catching up on the practical side in Doha. "We've got a good week to work together now," said the Dutchman, who intends to hit the ground running in 2017. "I want to win titles – that's all that matters," added Robben, signposting the ambition he still harbours in his ninth calendar year as a Bayern player. "A training camp like this is vital to get us into our rhythm." Defender Mats Hummels could only concur that the work in Qatar has been intense, but necessarily so. "I think it's good because we want to lay the foundations here," said the 2014 World Cup winner. "We've got to build up our strength." Bayern are going to need a lot of that as they head into a marathon four months in which they hope to contest 29 fixtures: 18 in the Bundesliga, seven in the UEFA Champions League and four in the DFB Cup. "We know all the big games come in the second half of the season, and we want to be ready," said Xabi Alonso. "This is an important period for us." Head here for more FC Bayern news!